Links to New Mexico's Agricultural and Horticultural insurance services and brokers: Crop, farm machinery, farm property etc. Specializes in providing comprehensive insurance for New Mexico's agriculture related business and in particular cattle and sheep ranches. Farm and ranch insurance can be tailored to protect the part-time gentleman farmer to the full scale agribusiness. Plans can include protection for your personal and business assets and legal liability insurance for both personal and farming pursuits. Promote your business with the United States leading online link site for farming. 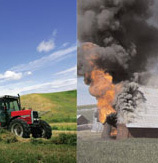 Get your Farm Insurance business noticed with a free listing on tawty.com and benefit from the power of this website.